Our moments of glory, detailed coverage, honourable mentions in TV, print and online media! ApnaComplex, India's largest and fastest growing Apartment Management and Security Solution, has partnered with LiveUp, India's leading Property Consultant, to make it quick and easy for Apartment owners to sell their Apartments. "Our data shows that typically 10% of houses in an Apartment Complex have been vacant since possession,"says Amit Tyagi, CBO, ApnaComplex. "A lot of owners of the vacant houses want to sell their house, but as they typically don't live in the same city, it becomes nearly impossible for them to reach out to buyers or show them the house. Owners also try to avail the services of a local broker, but with the opaque market, getting a trustworthy broker becomes a game of chance. So, most owners just leave the property locked for long periods of time." Read full article. CHENNAI: Malpractices in the delivery of water by private tankers may soon be plugged if a new app turns out to be successful. A startup, ApnaComplex, is currently testing `Water Monitor', a tablet based application which visually captures every water load entering apartment and housing complexes in the city .Gokul Singh, co-founder of the Bengaluru-based ApnaComplex, said the app is being tested at Jains Green Acres in Pallavaram, VGN Minerva in Nolambur, and TVH properties in Alwarpet, Velachery and RA Puram. Lack of piped water supply forces residents to turn to the ubiquitous water tanker. The expensive tankeris the only way out of their misery . Read full article. Bangalore, February 17, 2016 : Water is the essence of life. But, for many urban residents, the lack of piped supply of potable water forces them to turn to the ubiquitous water tanker. Read full article. In two months, with the onset of summer, the notorious water tanker mafia will spread its tentacles across Bengaluru. Even if apartment dwellers find it tough to monitor that water quality, they could now track the quantity right at the gate. Water Monitor, a tablet-based application, visually captures every waterload and promises to break that hitherto unchecked nexus between the tanker drivers and security guards. Read full article. As the water crisis increases in Bangalore, many urban residents due to lack of supply of water are forced to turn to water tankers for their daily requirement. The water from tankers, which is expensive irrespective of the quality, is the only way to get water, thus making people hostage to the nightmare of water tanker mafia Read full article. Urban living has never been simpler. Bursting at their seams, cities were threatening to descend into chaos till tech nological solutions arrived in the form of IT and mobile phones. From hailing a cab to ordering a pair of jeans or gadgets to getting grocery and even medicines for delivery at your doorstep, the tech solutions have come in handy for citizens to negate all the negatives that living in a city entails.Some apps have even removed the hurdles Bengalureans encounter in their everyday busy lives. TOI features some of these apps that are targeted as much at the micro-communities that make up the city as the individual residents. From ensuring tighter security to posting online plaints to enabling daily purchases, they seek to cover anything and everything. Read full article. Apartment management and accounting software. Read scanned copy of the full article (in Telugu). We understand Housing Societies better, and Housing Society Accounting even better. We know how thankless the job of a treasurer, or for that matter any office bearer is. First, its an upaid, voluntary job - next its too time consuming. To top that, some one or the other raises questions on intentions behind your actions. Its just thank less. That's the reason we created ApnaComplex - the Housing Society Software. Society Accounting can never get more easier than this. Reduce efforts with tools that automate or offer bulk imports, improve transparency by enabling entire society see the financials you want to share and more. In short, you will be wondering why you were not using ApnaComplex all along. National Association of Software and Services Companies - NASSCOM, on Tuesday, showcased 10 interesting product start-ups as a run-up to the 7th edition of the annual Product Conclave here.The Indian IT product industry has grown from $113 million to $1.64 million in the last 10 years and is expected to accelerate further with overall improvements in venture capital funding, incubation centers and availability of entrepreneurial talent. ApnaComplex is a tool for residential and commercial complexes. Read full article. Nasscom on Tuesday showcased 10 Indian product start-ups in a prelude to the seventh edition of its product conference, which begins on Wednesday. "The cloud is driving many a dream for small product companies," said Raja Sekhar Kommu, co-founder of Apnacomplex.com, which has a web-based product for maintenance, accounting and asset management at residential and commercial complexes. It was one of the firms showcased on Tuesday. Why you cannot miss ApnaComplex for your Housing Society? While living in a gated community in Hyderabad that had around 1000 apartments, Gokul saw how people in his complex struggled to maintain data and carry out day-to-day operations. So thinking about how the world is moving towards cloud-based offerings and taking into consideration the requirements of housing societies, coupled with his extensive IT experience, he came up with the idea of ApnaComplex. Read full article. ApnaComplex is a 'societal networking' tool. Designed to cater to the varying and sometimes complex needs to residential and commercial complexes. It integrates accounting, facility maintenance, communication and tracking into a single application. It aims to wean away Societies from isolated Google Groups/Excel Spreadsheet system of management. Residential and Commercial Complexes lack a tool that integrated accounting, asset management, communications between members, tracking and managing residents, tenants and staff. ApnaComplex frees Large Housing Societies from the hassle of complex book-keeping. Read scanned copy of the full article (in Hindi). A web-based computer-aided facility management solution ApnaComplex.com has been developed for helping residential and commercial complexes to manage their resources effectively online, without investing on additional storage servers. 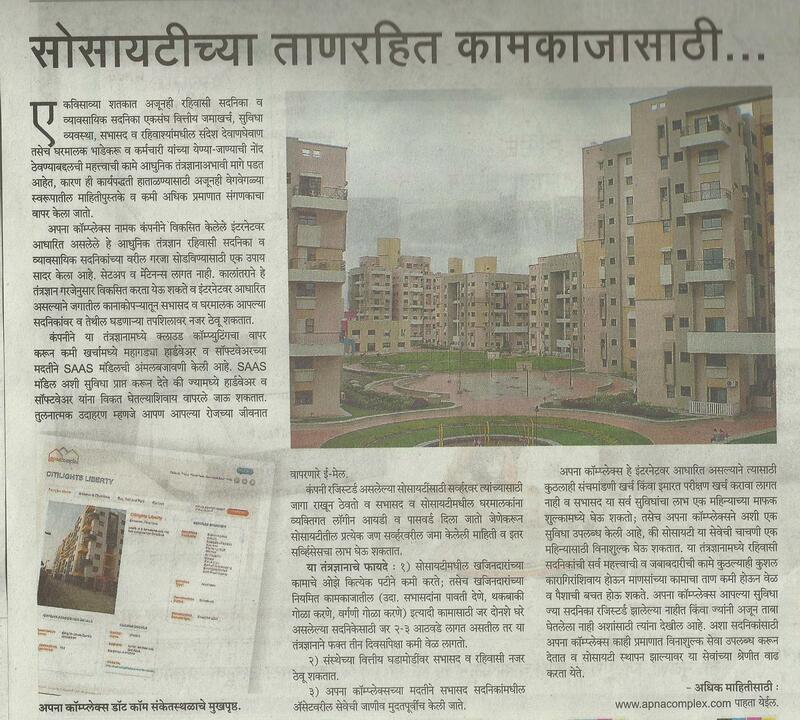 ApnaComplex featured in Sakal Property Supplement. Read scanned copy of full article (in Marathi). ApnaComplex uses SaaS (Software-as-a-Service) as a delivery mechanism for the functionality. By using SaaS, one can easily store software and data associated with it in a centralized server. The software has managing, accounting, and reporting tools. It not only saves time but reduces manual labour and therefore saves money. "ApnaComplex provides each management committee with an integrated tool, which manages all the information and helps them perform tasks at ease."